This article is for students who encounter issues when attempting to validate their device or laptop for ExamLock exams. If the steps below do not resolve the issues encountered, please contact the eClass support team by email at eclass@ualberta.ca or by phone at 780-492-9372. Error message: "There was a problem with uploading your evidence." Click on the notifications tray in the bottom-right corner of your screen. Next, click on All settings. On the left-hand side, click on Additional date, time, & regional settings. In this new window, click on Set the time and date. Next, switch to the Internet Time tab. Click on the Change settings... button. 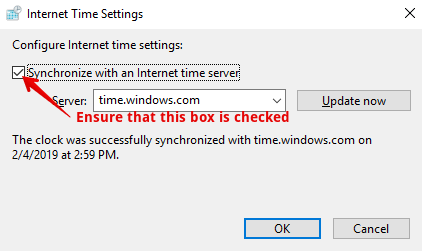 And finally, ensure that the Synchronize with an internet time server checkbox is checked. Click on Date & Time in the preferences. Ensure that the Set date and time automatically checkbox is checked. Once these settings have been verified on your device, your system time should be synchronized with internet time, and the evidence upload should be successful.